From the Wikipedia article Delta-v Budget. Re-entry from LEO—the delta-v required is the orbital maneuvering burn to lower perigee into the atmosphere, atmospheric drag takes care of the rest. Delta-v needed to move inside Terra–Luna system (speeds lower than escape velocity) are given in km/s. 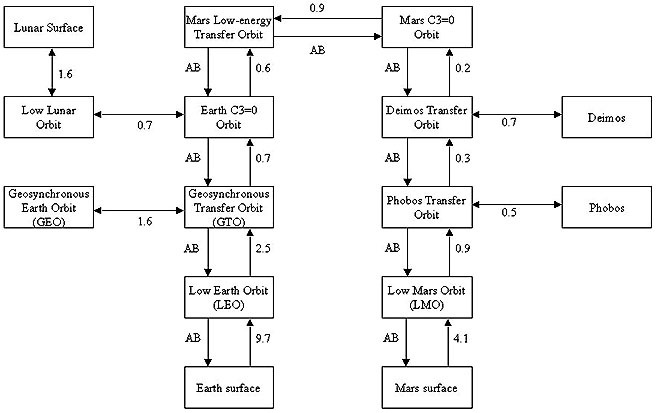 This table assumes that the Oberth effect is being used—this is possible with high thrust chemical propulsion but not with current (as of 2011) electrical propulsion. The return to LEO figures assume that a heat shield and aerobraking/aerocapture is used to reduce the speed by up to 3.2 km/s. The heat shield increases the mass, possibly by 15%. Where a heat shield is not used the higher from LEO Delta-v figure applies, the extra propellant is likely to be heavier than a heat shield. LEO-Ken refers to a low earth orbit with an inclination to the equator of 28 degrees, corresponding to a launch from Kennedy Space Center. LEO-Eq is an equatorial orbit. Current electric ion thrusters produce a very low thrust (milli-newtons, yielding a small fraction of a g), so the Oberth effect cannot normally be used. This results in the journey requiring a higher delta-v and frequently a large increase in time compared to a high thrust chemical rocket. Nonetheless, the high specific impulse of electrical thrusters may significantly reduce the cost of the flight. For missions in the Terra–Luna system, an increase in journey time from days to months could be unacceptable for human space flight, but differences in flight time for interplanetary flights are less significant and could be favorable. The table below presents delta-v's in km/s, normally accurate to 2 significant figures and will be the same in both directions, unless aerobreaking is used as described in the high thrust section above. The spacecraft is assumed to be using chemical propulsion and the Oberth effect. 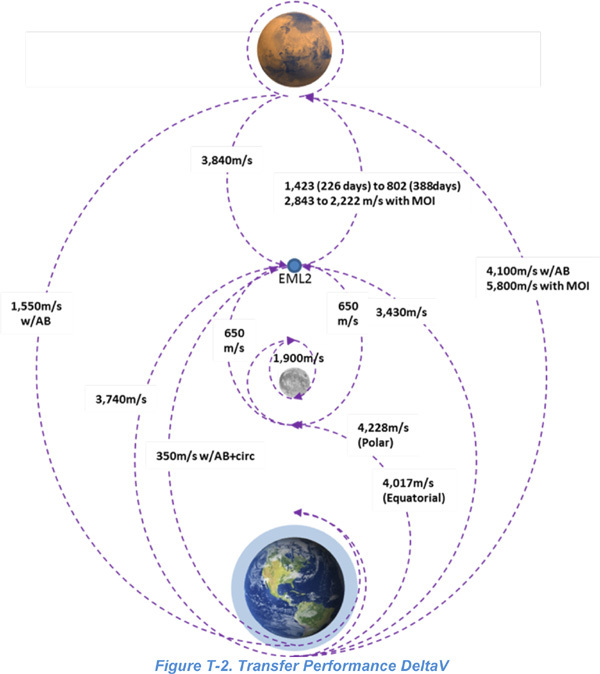 (ed note: From EML1, Mars transfer costs 0.74km/s. Mars capture costs 0.9km/s and the move to low Mars orbit costs 1.4km/s. Trip total is just over 3km/s. 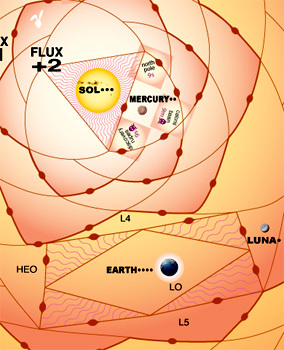 According to Marsden and Ross, "The energy levels of the Sun–Earth L1 and L2 points differ from those of the Earth–Moon system by only 50 m/s (as measured by maneuver velocity)." Near-Earth objects are asteroids that are within the orbit of Mars. The delta-v to return from them are usually quite small, sometimes as low as 60 m/s, using aerobraking in Earth's atmosphere. However, heat shields are required for this, which add mass and constrain spacecraft geometry. 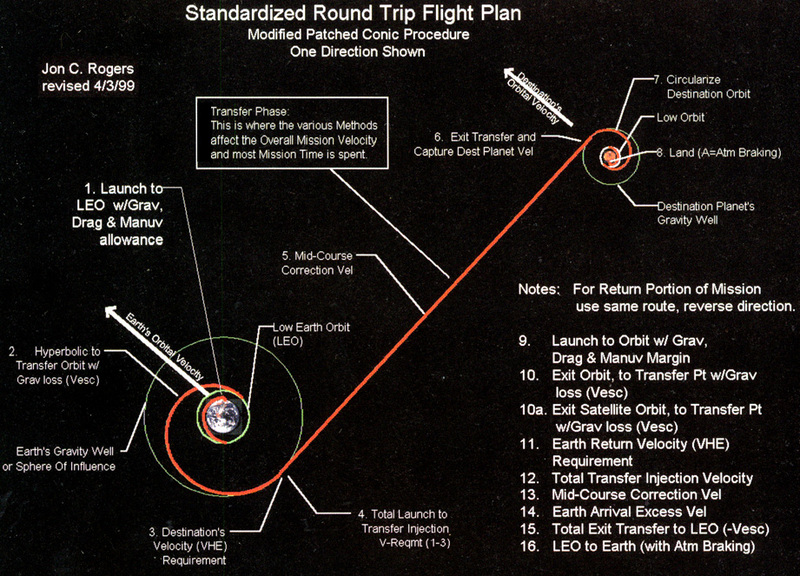 The orbital phasing can be problematic; once rendezvous has been achieved, low delta-v return windows can be fairly far apart (more than a year, often many years), depending on the body. However, the delta-v to reach near-Earth objects is usually over 3.8 km/s, which is still less than the delta-v to reach the Moon's surface. 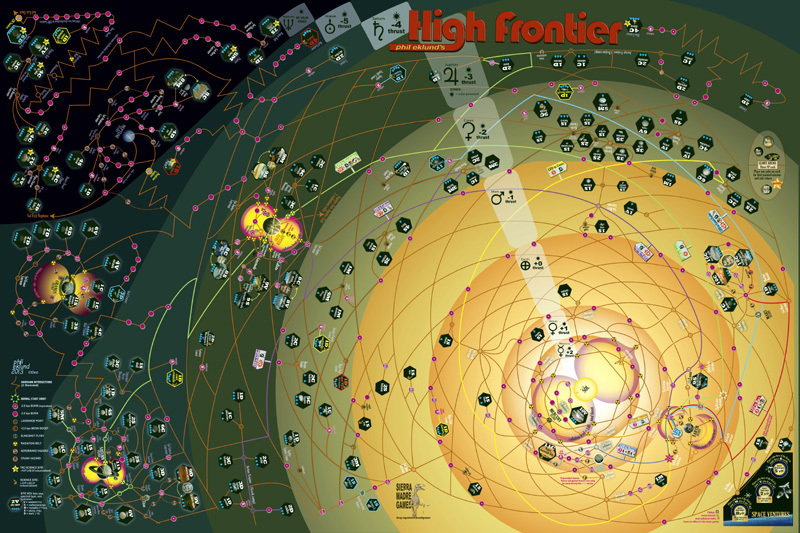 In general bodies that are much further away or closer to the Sun than Earth have more frequent windows for travel, but usually require larger delta-vs.
My text for this sermon is the set of delta v maps, especially the second of them, at the still ever-growing Atomic Rockets site. These maps show the combined speed changes, delta v in the biz, that you need to carry out common missions in Earth and Mars orbital space, such as going from low Earth orbit to lunar orbit and back. Two things stand out in this list. One is how helpful aerobraking can be if you are inbound toward Earth, or any world with a substantial atmosphere. Many craft in orbital space will be true aerospace vehicles, built to burn off excess speed by streaking through the upper atmosphere at Mach 25 up to Mach 35. But what really stands out is how easily within the reach of chemical fuels these missions are. Chemfuel has a poor reputation among space geeks because it barely manages the most important mission of all, from Earth to low orbit. Once in orbit, however, chemfuel has acceptable fuel economy for speeds of a few kilometers per second, and rocket engines put out enormous thrust for their weight. In fact, transport class rocket ships working routes in orbital space can have mass proportions not far different from transport aircraft flying the longest nonstop global routes. A jetliner taking off on a maximum-range flight may carry 40 percent of its total weight in fuel, with 45 percent for the plane itself and 15 percent in payload. A moonship, the one that gets you to lunar orbit, might be 60 percent propellant on departure from low Earth orbit, with 25 percent for the spacecraft and the same 15 percent payload. The lander that takes you to the lunar surface and back gets away with 55 percent propellant, 25 percent for the spacecraft, and 20 percent payload. This is a table of mission parameters calculated by Jon C. Rogers for the book Spaceship Handbook. It lists round-trip missions starting at Terra's surface, traveling to and landing on the destination planet (or at low orbit for Venus, Jupiter, Saturn, Uranus, and Neptune; due to the fact that the atmospheric pressure of these planets will crush your spacecraft like a cheap beer can) then lifting off, traveling back to and landing on Terra. I repeat, this is for round trips, not one-way trips. For instance, the entries for Luna are the trip Terra to Luna then Luna to Terra. Or Luna to Terra then Terra to Luna. Mr. Rogers is interested in comparing the different trajectory types, so the focus is on splitting the mission into standard blocks, rather than optimizing for minimum delta V. An optimized missiom will require less delta V than what is listed in the table (approximately 5% to 10% less delta V). As a verification, Mr. Rogers used his mathematical model to calculate a mission to Luna and compared it to the actual data reported by NASA for the Apollo 11 mission. His model said delta V of 16.905 km/s which is within 3% of the NASA Apollo 11 delta V of 16.479 km/s. Six trajectories are listed, three impulse types and three constant acceleration brachistochrone types. "Impulse" means the spacecraft makes an initial burn then coasts for months. Impulse trajectory I-1 is pretty close to a Hohmann (minimum delta V / maximum time) orbit, but with a slightly higher delta V.
Impulse trajectory I-2 is in-between I-1 and I-3 (it is equivalent to an elliptical orbit from Mercury to Pluto, the biggest elliptical orbit that will fit inside the solar system). Impulse trajectory I-3 is near the transition between delta V levels for high impulse trajectories and low brachistochrone trajectories (it is a hyperbolic solar escape orbit plus 30 km/s). Brachistochrone (maximum delta V / minimum time) trajectories are labeled by their level of constant acceleration: 0.01 g, 0.10 g, and 1.0 g.
The transit times are important for figuring things like how much food and life support endurance must be carried, mission radiation total dosage, and damage to astronauts due to prolonged microgravity exposure. In fact, if you have a hard limit on, say, total radiation dosage, you can examine the table and rule out any mission trajectory whose transit time exceeds it. Values are delta V in m/s, with transit times in parenthesis. Y = years, M = months, D = days, H = hours. Planets in gold have atmospheric pressure that will crush your ship like an eggshell, do not land there. The delta V cost for gold planets does not include landing and take-off delta V, only delta V to low orbit. thru 16 And then Repeat the process in reverse to come back to Earth. By breaking the trip up into stages we can break out and compare the TRANSFER VELOCITY of the differing Orbits and compare them...and still be very close to the actual Delta V of a typical mission. So, by this method I produced a valid statistical comparison of different orbits velocity requirements and round trip duration requirements. Real mission planners will beat my numbers by approximately 5-10% perhaps, but that only means you would have that much 'gas' left in the tanks following my flight plans. Bottom line, dont forget to carry fuel for those mid course maneuvers (errors and asteroids— Darn Rocks!!) and also to land or you'll find yourself in space with no fuel! And now you know why I say: "May your jackstands strike earth before your tanks run dry! 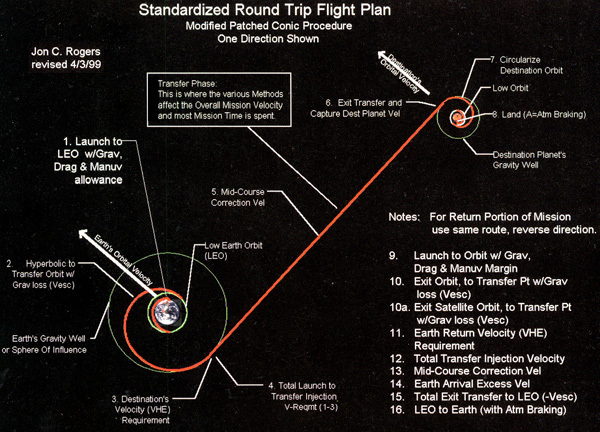 Using the mission table above, Mr. Rogers took a list of major propulsion systems and calculated which ones were up to the task of peforming said missions. Note that Mr. Rogers values for the exhaust v3elocity of the propulsion systems might differ slightly from the ones I have on the mission list. 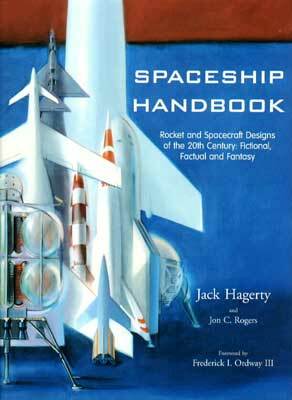 Cross reference the mass ratio, propulsion system, and mission trajectory. If there is a colored box at the intersection, the propulsion system can perform that mission. Example: For a 1 Stage minimum payload (mass ratio of 9.1), using a Nuclear Fission Gas Core reactor, with a Mars Impulse trajectory I-2, the presence of a hot pink box says that propulsion system is capable of that mission. But it is not capable of performing a Mars Constant Brachistochrone 0.01g mission. Below are a series of tables for Hohmann transfer delta V requirments. Unlike the above table, they are for one-way trips to various destinations. For instance, the above table will give requirements for a Terra-Mars-Terra mission, but the tables below will give requirements for a Terra-Mars mission. The tables assume that an orbit for each of the bodies is 100 km altitude (even for pointlessly tiny ones like Phobos and Deimos), and for surface launches it is presumed that all the bodies have no atmosphere (not true for, say, Titan). The tables were created by Erik Max Francis' amazing Hohmann orbit calculator and the easy to use Python programming language (sample program here and here). All bodies are spherical, and rotate with constant angular velocity. All orbits are circular, with another body or a gravitating point at the center (except for toplevel objects like the Sun); thus all bodies orbit with constant angular velocity. All orbits are prograde. This affects only a few major worlds (e.g., Triton) and numerous, tiny, outer Solar System distant satellites. The rotation of objects could possibly be retrograde, since that is only indicated by means of a negative period. All bodies have negligible size compared to their orbits, and all suborbits have negligible size compared to their parent orbits. Only objects with actual proper names are included in BOTEC's database. Even objects such as asteroids and satellites with provisional names are not included here. No comets, whether given proper names, or not, however, are included. This would not be hard to change. For all orbital transfers, it is assumed that the durations of application of deltavee are much shorter than the duration of the flight time. That is, burns are treated as instantaneous (that is, orbital transfers are "impulsive"). This is a good approximation in most cases (even with chemical rockets), but not with more exotic drive systems like ion drives or solar/magnetic sails. Start and destination planets are labeled along axes, it does not matter which axis you use for start or destination. In both sections, "y" means "years", "m" means "months", "d" means "days", and "h" means "hours"
Values below the diagonal in blue: First value is delta V (meters per second) needed for a Hohmann transfer from orbit around one world to orbit around the other, landing on neither. Second value is the transit time for the transfer. 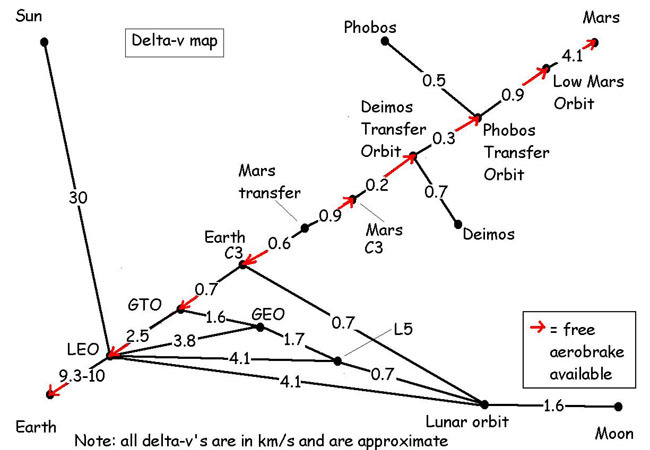 Values above the diagonal in red: First value is delta V (meters per second) needed for a Hohmann transfer between the worlds, including take-off and landing (If either is a gas giant, a 100 kilometer orbit is used instead of the planet's surface). Second value is the Synodic period (i.e., frequency of Hohmann launch windows). Diagonal values in gold are delta V's needed to take off from the surface of a world and go into circular orbit around it, or to land from a circular orbit. Find the "Mars" row and move along it until you reach the "Jupiter" column. The cell is above the diagonal, printed in red letters. The first number says that if you lift-off from Mars, travel to Jupiter in a Hohmann trajectory, and land (meaning enter a 100 km circular orbit), the spacecraft will expend 25,265 meters per second of delta-V (same delta-V if you start at Jupiter and travel to Mars). The second number says the launch window for the Mars-Jupiter Hohmann opens every two years and 2.8 months (same for Jupiter-Mars Hohmann). 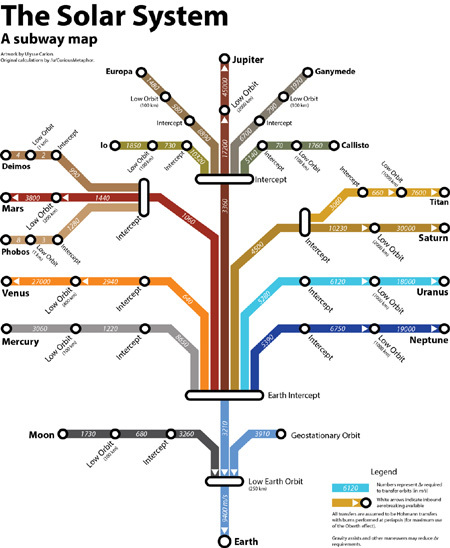 Now, find the "Jupiter" row and move along it until you reach the "Mars" column. The cell is below the diagonal, printed in blue letters. The first number says if you start in a low Mars orbit and travel to a low Jupiter orbit in a Hohmann trajectory, the spacecraft will expend 21,956 m/s of delta-V (same delta-V if you start at Jupiter and travel to Mars). The second number says the Hohmann transfer will take 3 years and 1 month to reach its destination. As a side note, this style of table apparently originated with Jerry Pournelle in his science essay Those Pesky Belters and Their Torchships. By which I mean values below the diagonal are orbit-to-orbit, values above the diagonal are surface-to-surface, and the diagonal is takoff or landing. Be aware of the simplifying assumptions. Meaning that the values here are close approximations but not exact. If you want exact you will need NASA-grade trajectory software. 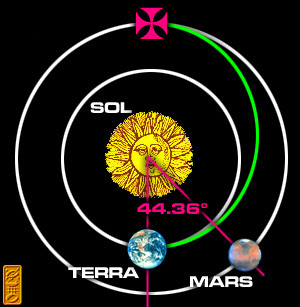 For Terra-Mars Hohmann, at launch window Mars is 44.36° ahead of Terra. Planets are rotating counter-clockwise. "What's delta V from Earth orbit to Mars orbit?" -- a common question in science fiction or space exploration forums. The usual answer given is around 6 km/s, the delta V needed to go from a low, circular Earth orbit to a low, circular Mars orbit. A misleading answer, in my opinion. There are a multitude of possible orbits and low circular orbits take more delta V to enter and exit. 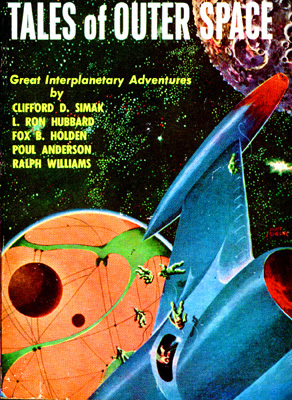 A science fiction writer using 6 km/s for Earth orbit to Mars orbit has a needlessly high delta V budget. There are capture orbits that take much less delta V to enter and exit. By capture orbit I mean a periapsis as low as possible and apoapsis as high as possible. A capture orbit's apoapsis should be within a planet's Sphere Of Influence (SOI). rsp is distance between sun and planet. The table below is modeled after a mission table at Atomic Rockets, a popular resource for science fiction writers and space enthusiasts. • Departure and destination planets are along the left side and across the top of the table. 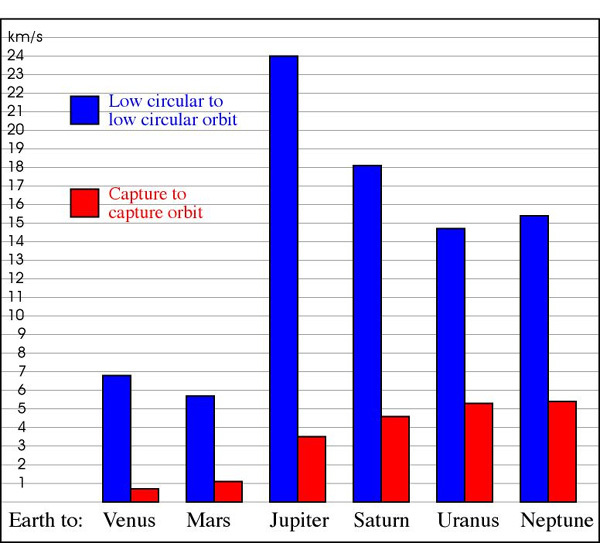 • Numbers below the diagonal in blue are delta V's needed to go from departure planet's low circular orbit to destination planet's low circular orbit. These are about the same as the blue quantities listed at Atomic rockets. • Numbers above the diagonal in red are delta V's needed to go from departure planet's capture orbit to desitnation planet's capture orbit. It's easy to see the red numbers are a lot less than the blue numbers. I used this spreadsheet to get these numbers. The spreadsheet assumes circular, coplanar orbits. If a low circular orbit at the destination is needed, it's common to do a burn to capture orbit with the capture orbit's periapsis passing through the upper atmosphere. Each periapsis pass through the upper atmosphere sheds velocity, lowering the apoapsis. Thus over time the orbit is circularized without the need for reaction mass. The planets in the table above have atmospheres, so the drag pass technique can be used for all of them. A delta V budget is from propellant source to destination. If propellant depots are in high orbit, the needed delta V is closer to departing from a capture orbit than departing from a low circular orbit. Thus it would save a lot of delta V to depart from Earth-Moon-Lagrange 1 or 2 (EML1 or EML2) regions. The poles of Luna have cold traps that may have rich volatile deposits. This potential propellant is only 2.5 km/s from EML1 and EML2. Entities like Planetary Resources have talked about parking a water rich asteroid at EML1 or 2. Whether EML propellant depots are supplied by lunar or asteroidal volatiles, they would greatly reduce the delta V for interplanetary trips. Mars' two moons, Phobos and Deimos, have low densities. Whether that is from volatile ices or voids in a rubble pile is still unknown. If they do have volatile ices, these moons could be a propellant source. It would take much less delta V departing from Deimos than low Mars orbit. All the gas giants have icey bodies high on the slopes of their gravity wells. However the axis of Uranus and her moons are tilted 97 degrees from the ecliptic. The plane change would be very expensive in terms of delta V. So the moons of Uranus wouldn't be helpful as propellant sources. Venus has no moon. So of all the planets listed above, only Uranus and Venus lack potential high orbit propellant sources. Anyway you look at it, the blue numbers from conventional wisdom are inflated. These are "maps" of the delta-V cost to move from one "location" to another (instead of maps of the distance from one location to another). A spacecraft with propellant in the tanks has a delta-V reserve (NASA calls it the delta-V "budget"). Spacecraft "spend" delta-V from their budget to "pay" for the cost of moving from one location to another (what they actually do is burn their rocket engine to expend propellant and thus perform a maneuver). The unit of currency in the delta-V budget is the meter per second of velocity change (abbreviated as "m/s"). If you'd rather use larger denominations then 1,000 m/s of delta-V is equal to 1 kilometer per second of delta-V ("km/s"). Keep in mind that some of the locations are actually orbits. And keep in mind that the "locations" are just useful waypoints spacecraft use to get from one interesting planet/moon/whatever to another. 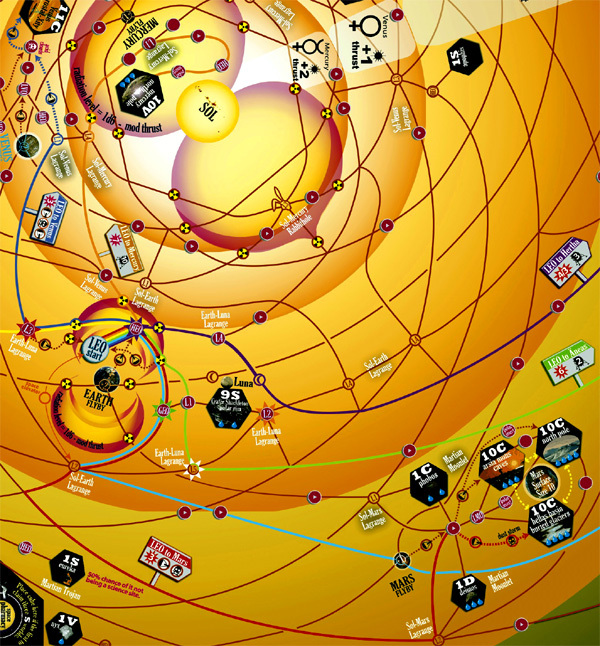 Meaning that there are actually infinitely many "locations", but most of them do not lead to anywhere except a one-way trip into the inky depths of space. We didn't bother to put such worthless locations on the map because what's the point? If there is a planet with an atmosphere involved and your spacecraft has an aeroshell, then "aerobraking" may be used (i.e., diving through the planet's atmosphere to use friction to burn off delta-V for free in lieu of expending expensive propellant). There is a limit to how much delta-V can be gotten rid of by aerobraking. The general rule is that aerobraking can kill a velocity approximately equal to the escape velocity of the planet where the aerobraking is performed (10 km/s for Venus, 11 km/s for Terra, 5 km/s for Mars, 60 km/s for Jupiter, etc.). Finally, all these maps show the minimum delta-V cost for travel. This is because for most near-future spacecraft their delta-V budgets are quite tiny. In other words the spacecraft are poor and can only afford to purchase shoddy items from the dollar store. In this case, "shoddy items" means Hohmann Transfer orbits. They are shoddy because they take a long time to travel (e.g., about nine months to travel from Terra to Mars) and because you can only use it when the launch window opens (e.g., every 26 months for Terra to Mars). Transit time and launch windows to a few major destinations can be found here. The flip side is if you have a far-future spacecraft with an outrageously huge delta-V budget (a "torchship"), you do not need any of these maps. You just point your ship at the destination and ignite the engines. To find the delta-V cost and transit time refer to the Mission Tables under the columns labeled "Brachistochrone". Data from DeadFrog42 and Hop David. 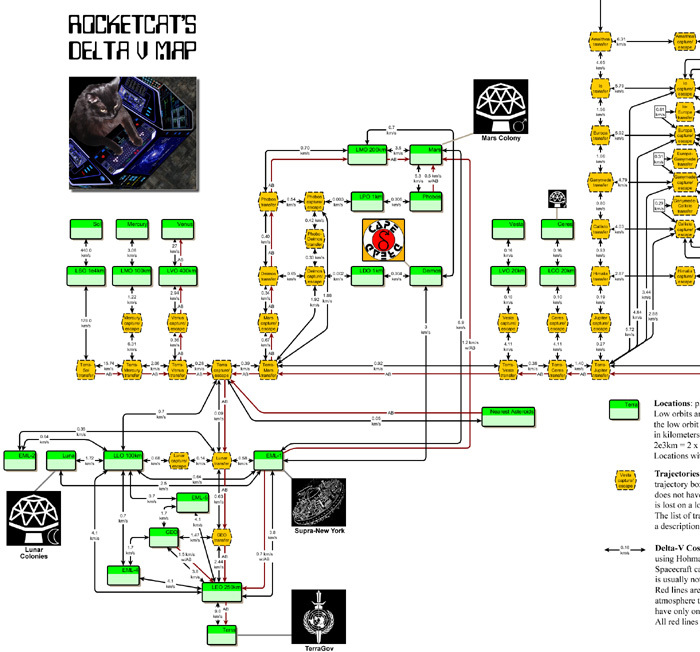 Delta-V map for most of the solar system made by DeadFrog42. He or she said the delta-V's were calculated mainly using the Vis-Viva equation. 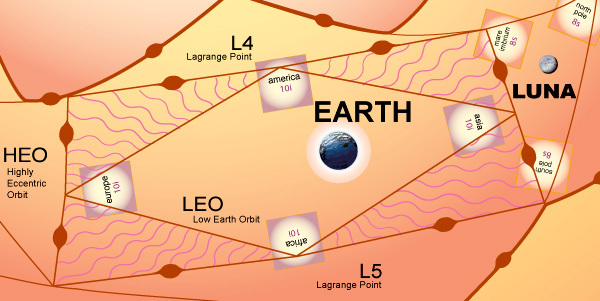 LEO: Low Earth Orbit. Earth orbit from 160 kilometers to 2,000 kilometers from the Earth's surface (below 200 kilometers Earth's atmosphere will cause the orbit to decay). The International Space Station is in an orbit that varies from 320 km to 400 km. GEO: Geosynchronous Earth Orbit. Earth orbit at 42,164 km from the Earth's center (35,786 kilometres from Earth's surface). Where the orbital period is one sidereal day. A satellite in GEO where the orbit is over the Earth's equator is in geostationary orbit. Such a satellite as viewed from Earth is in a fixed location in the sky, which is intensely desirable real-estate for telecommunications satellites. These are called "Clarke orbits" after Sir. Arthur C. Clarke. Competition is fierce for slots in geostationary orbit, slots are allocation by the International Telecommunication Union. EML1: Earth-Moon Lagrangian point 1. On the line connecting the centers of the Earth and the Moon, the L1 point is where the gravity of the two bodies cancels out. It allows easy access to both Earth and Lunar orbits, and would be a good place for an orbital propellant depot and/or space station. It has many other uses. It is about 344,000 km from Earth's center. Chart is from Rockets and Space Transportation. Delta Vs are in kilometers per second. "AB" means "aerobraking", that is, the planet's atmosphere may be used to change delta V instead of expending thrust. Chart by Wolfkeeper diagraming delta V requirements in cis-Lunar and Martian space. Topologically this is almost identical to the previous map, but there are some differences. In terms of Delta-V, Earth-Moon-Lagrange-1 (EML1) is very close to LEO, GEO and lunar volatiles (moon ice/propellant). By Hop David. 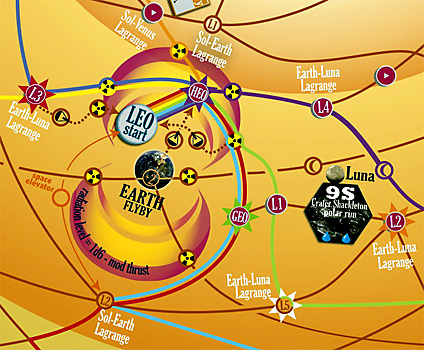 Earth-Moon-Lagrange-1 (EML1) is only 1.2 kilometers/second from grazing Mars' atmosphere. From there the remaining velocity changed needed can be accomplished with aerobraking. By Hop David. 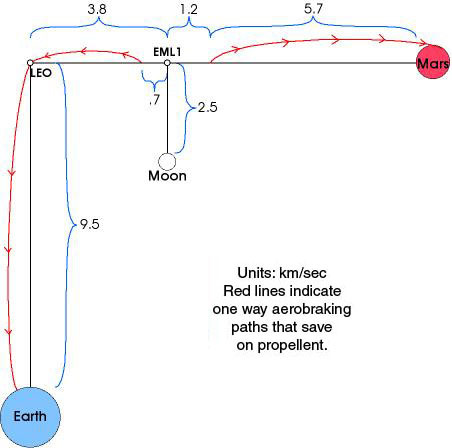 In terms of delta-V, Earth-Moon-Lagrange-1 (EML1) is only 2.5 km/sec from the moon and 3.8 km/sec from LEO. 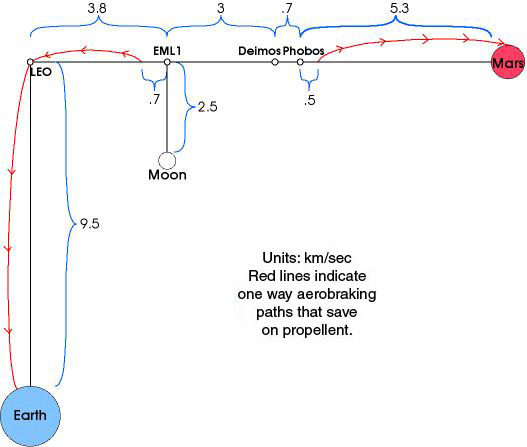 If aerobraking drag passes are used, it would only take .7 km/sec to get from EML1 to LEO (red lines indicate one-way delta-V saving aerobraking paths). By Hop David. 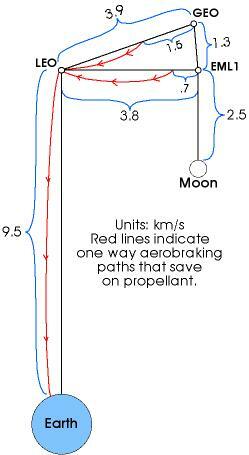 It takes about .65 km/sec to drop from Earth-Moon-Lagrange-1 (EML1) to a 300 km altitude perigee. At perigee the cargo is moving nearly escape speed, 3.1 km/sec faster than a circular orbit at that altitude. 3.1 - .65 is about 2.4. EML1 has about a 2.4 km/sec advantage over LEO. From a high apogee, plane changes are inexpensive. So it's easier to pick your inclinitation from EML1. EML1 moves 360 degrees about the earth each month, so you can choose your longitude of perigee when a launch window occurs. Space system performance, deltaV, was defined for each leg of the space transfer as shown in Figure T-2. For Earth-moon transfer, the deltaV is taken the maximum actually used for the seven Apollo moon missionsviii. However, for the Apollo descent trajectory, there was a flight path angle hold for the pilot to view the landing site for large boulders or small craters (7% penalty); and for the final approach, there were six hover maneuvers for pilot attitude and speed corrections. In addition, there were additional contingencies for engine-valve malfunction, redline low-level propellant sensor, and redesignation to another site (9% penalty). In this study, it was assumed that the landing sites are fully defined, advanced laser sensors for remote site debris and crater checkout, and modern propellant and engine sensors for measuring and establishing final engine performance. In addition, the final descent time was reduced from the 45 seconds baselined in Apollo to 30 seconds at a decent velocity of 0.1 m/s. 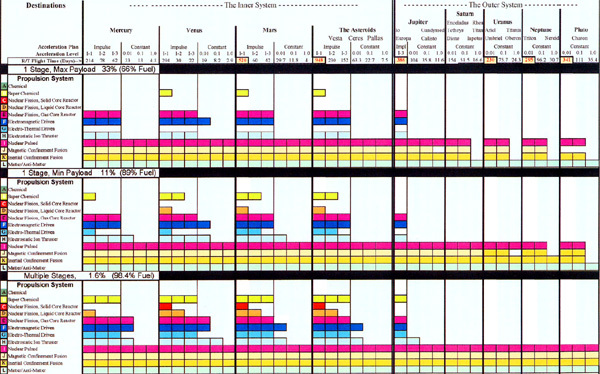 For polar lunar missions, the cis-lunar performance was taken from NASA’s Exploration Systems Architecture Study that provided the baseline systems for NASA’s Constellation programix. The performances of transfers from Earth to Earth-moon L2 and from there to Mars orbit were taken from various referencesx, xi, xii, xiii. The selected data are for direct missions only. Performance can be optimized for specific dates of transfer using gravity turns but cannot be used in this study because specific missions and dates are not available. 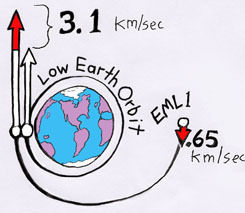 Simple orbital mechanics defined the 1-body orbit around Earth to a periapsis of Earth-moon L2 to compute the periapsis deltaV and the atmospheric entry speed of 11km/s. Finally for all deltaVs in Figure T-2, an additional 5 percent reserve is used. viii Richard W. Orloff. “Apollo By The Numbers”. NASA SP-2000-4029, 2000. 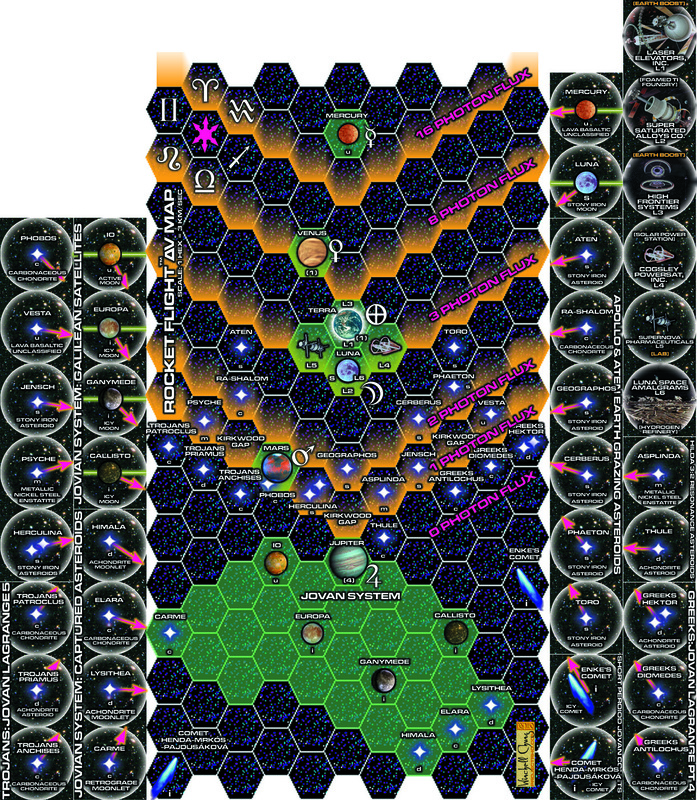 In the also regrettably out of print game Rocket Flight the map is ruled off in hexagons of delta V instead of hexagons of distance (wargames use hexagons instead of squares so that diagonal movement is the same distance as orthogonal). Moving from one hex to an adjacent hex represents a delta V of 3 kilometers per second. 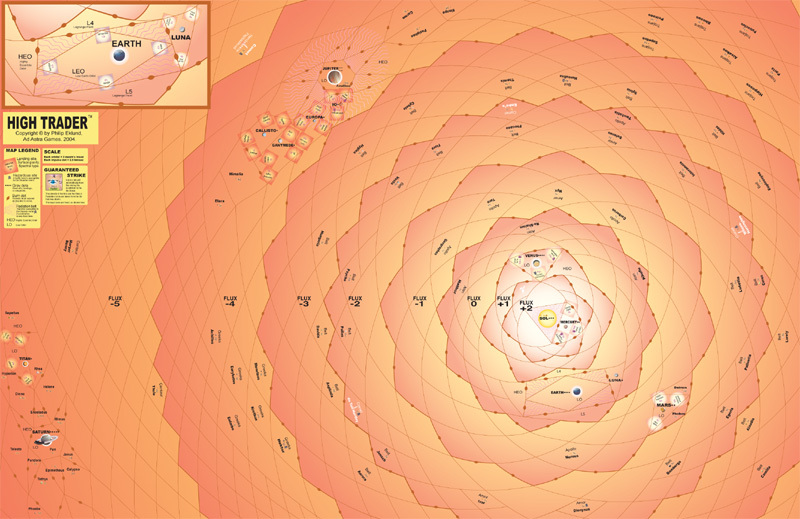 This also means that in this map each hexagon represents an entire orbit (instead of a location), due to "rotating frames of reference" (no, I do not quite understand that either; but people I know who are more mathematically knowledgable than I have assured me that it is a brilliant idea). If you want to move two hexes in one turn, you have to burn four times the specified number of propellant points. You can move three hexes for eight times the propellant, four hexes for 16 times the propellant, and 5 hexes for 32 times the propellant. Which is why most people opt to just move one hex per turn unless it is an emergency. However, the various propulsion systems have a maximum mass flow rate, which is the maximum number of propellant points it can expend in one turn. This corresponds to the spacecraft's acceleration rate. The black hexagons are sites, which are planets, moons, and asteroid spacecraft can land on. 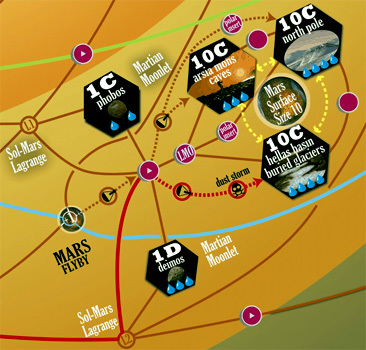 some planets are composed of several sites, e.g., the planet Mars is composed of three sites: North Pole, Hellas Basin Buried Glaciers, and Arsia Mons Caves. 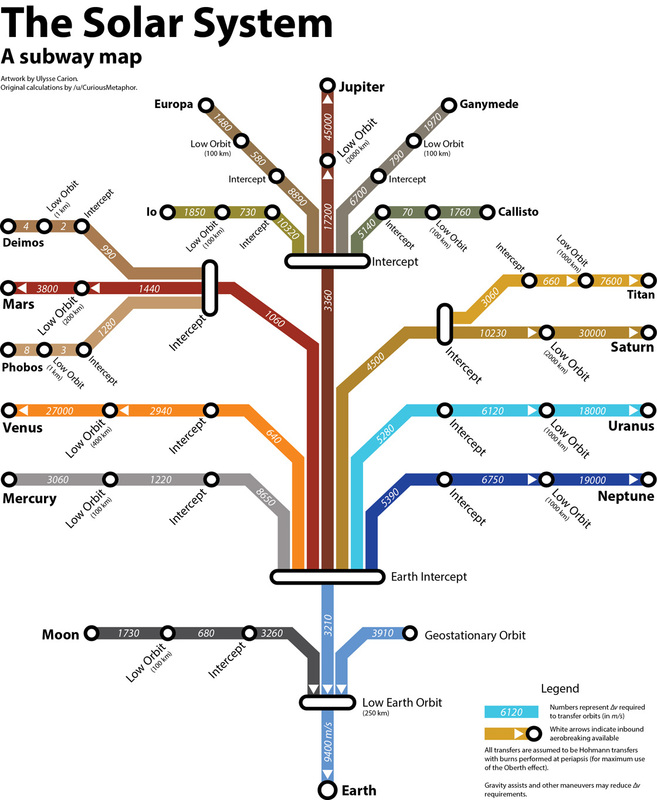 Sites are connected by lines called routes which are paths that spacecraft can move along. During the turn, a spacecraft can move as far as it wants along a path, until it encounters a pink circle. In order to enter a pink circle it has to expend one "burn" (paying the 2.5 km/sec delta V cost and also expending a unit of propellant). 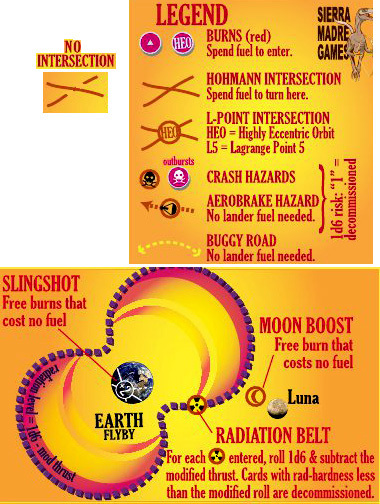 At the beginning of each turn, a spacecraft is given an allotment of "burns" equal to its acceleration rating. These burns can be used during its turn, unused burns are lost. Remember in order to use a burn the spacecraft must pay a point of propellant. When a spacecraft runs out of burns, it can no longer enter pink circles during this turn. It has to stop on any "Intersections" on its current path prior to the pink circle. And when a spacecraft runs out of propellant, it can no longer make burns at all until it is refueled no matter what turn it is. The number of propellant units and the acceleration rating of a spacecraft depends upon its propulsion system and mass ratio. Different routes cross each other. 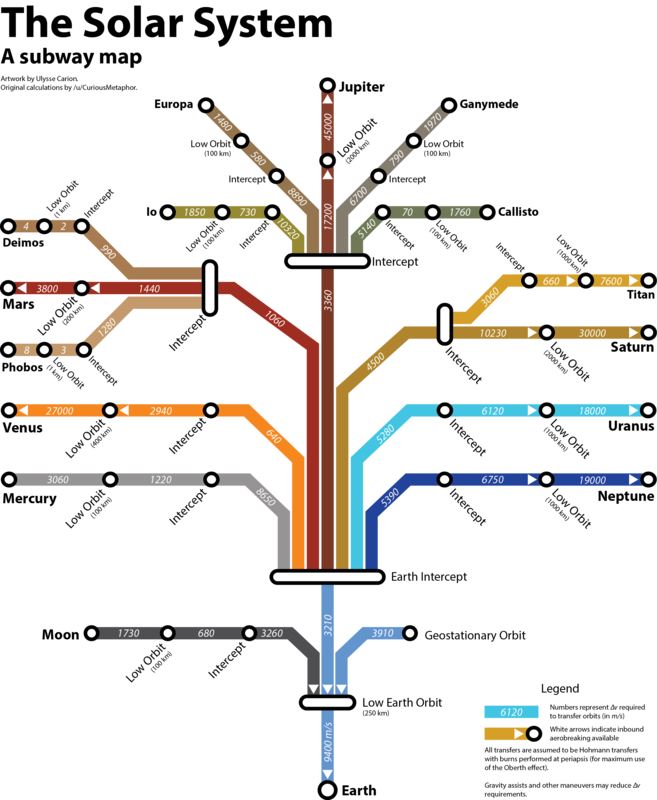 If one of the routes has a gap (so it appears that one route goes "over" and the other goes "under", see "No Intersection" in the diagram) the two routes are not connected. If both routes have no gaps they are connected, this is called a "Hohmann Intersection". If the place the two routes cross is marked with a circle they are connected, this is called a "Lagrange Intersection." At the end of a turn all spacecraft must be occupying either an Intersection or a Site. A spacecraft can turn at an Interstection to switch from the route it is on to the route it was crossing (otherwise it has to stay on its current route). It costs one burn to turn at a Hohmann intersection, turning at a Lagrange intersection is free (due to gravity being negated by a nearby planet). Skull and Crossed Bones: a Crash Hazard. Spacecraft has to roll a die to see if it crashes and is destroyed. Parachute: an Aerobrake Hazard. Spacecraft has to roll a die. If it rolls 2 to 6, it successfully areobrakes, and can now move to land on a Site with no cost in propellant. If it rolls a 1, it burns up in reentry and is destroyed. Spacecraft with Atmospheric ISRU Scoops are immune to Aerobrake Hazards, they are automatically successful. In addition such spacecraft can refuel if they ends their move there. A spacecraft using one of the three kinds of lightpressure sail propulsion is automatically destroyed if it enters an Aerobrake Hazard. Number: Gravitational Slingshot. Spacecraft obtains that number of extra burns which do not require propellant to be expended. These burns can be used in the remainder of the game turn. NASA loves gravitational slingshots and use them at every opportunity. Lunar Crescent: Moon Boost. As per Gravitational Slingshot, except it only gives +1 extra propellant-free burn. Nuclear Trefoil: Radiation Belt. Spacecraft entering this suffer a radiation attack. Roll one die and subtract the spacecraft's modified thrust to find the radiation level (the faster you can fly the lower the radiation dose). All spacecraft systems with a radiation hardness lower than the radiation level are destroyed. If sunspots are active add 2 to the die roll. The UN Cycler is immune to the Earth radiation belt. Spacecraft with a sail propulsion system are immune to radiation belts. Spacecraft with Magnetic Sails are immune and in addition get a Moon Boost. The concentric gold circles show solar intensity, used for figuring thrust of solar sails. The lop-eared bunny rabbit head slightly above center is the "rabbit hole." This is the FTL jump point from Attack Vector: Tactical. Earth has lots of Radiation Belt hazards due to the Van Allen Belt. The Earth Flyby Lagrange Intersection is a +2 Gravitational Slingshot. Luna has two Moon Boost Lagrange Intersections. The planet Mars is composed of three sites: North Pole, Hellas Basin Buried Glaciers, and Arsia Mons Caves (black hexagons). Spacecraft can attempt to Aerobrake into Arisa Mons (little parachute symbol). If it tries to Aerobrake into Hellas Basin it also has to run the risk of deadly dust stormes (skull-and-crossbones symbol). Entering the North Pole requires doing a burn for a change-of-plane maneuver to enter a polar orbit (pink circle labeled "polar insert"). The Mars Flyby Lagrange Intersection is a +1 Gravitational Slingshot. A pity this game never saw the light of day. Each triangle or diamond shape is an Orbital. Spacecraft in orbitals must always be facing one of the sides of the orbital. Turning to face an adjacent side requires one burn of 2.5 km/s delta V. Spacecraft can move from the orbital they are in, jumping over the face they are pointing at, and enter the next orbital. There is no cost to do so unless the face has a Burn Dot on it. In that case the spacecraft must expend one burn of 2.5 km/s delta V. If the spacecraft does not have that much delta V left it is forbidden to cross the Burn Dot. Each new orbital entered adds 2 months to the spacecraft's travel time. The white lop-eared bunny rabbit head in upper left corner is the "rabbit hole." This is the FTL jump point from Attack Vector: Tactical.